Mirror Image is a Mastery Wizard skill unlocked at Level 25, creating an illusionary duplicate of the Wizard. The duplicates have hit points and move around just like the Wizard, casting from the same available skills and creating a useful distraction for the enemies. Their attacks do not deal any damage though, and they are purely tanks/distractions, not offensive weapons. In order to avoid close combat as much as possible, the Wizard can create duplicates of herself, who will also aggressively attack opponents. Refer to the Mirror Image rune effects article for thorough descriptions of all five rune effects in this skill, including screenshots, videos, strategy tips, and other related information. This skill creates a duplicate of the Wizard that uses Wizard spells to ferociously attack monsters the instant it appears. The Image's spells don't do any damage, so it's more like an animated Decoy than a Shadow Master. But it works like a tank, with monsters attacking the Image if it is closer to them than the Wizard, and as anyone who has played artillery characters knows, a tanking minion (or another player) is beyond value. Lesser known effects of Mirror Images is that it sheds almost all debuffs, and breaks almost all forms of CC adding to its uses. You can break Jailer with this. You can be already Frozen and break that with this. Will dispel Diablo's Conflagration skill. If you have Fracture (db) rune on Teleport (db) that will dispel any mirror images you have up. Mirror Image was first shown at BlizzCon 2008 when the Wizard was unveiled, where it was at Tier II on the Conjuring Skill Tree. It then spawned five illusion images. I didn’t use this one very often during play, since the Wizard was powerful enough to slaughter most attackers without needing the assistance, but the few times I did Mirror Image, against big mobs, it worked marvelously. The mirror doesn’t last for very long, usually dying to the monster onslaught, but it didn’t have to. The Wizard has a number of nice AoE spells, even at low levels, and all the MI had to do was provide a focal point for the Fallen or Dark Cultists to swarm around to turn them into fish in a barrel for Arcane Orbs. Mirror Image was still listed at BlizzCon 2010, but it wasn't one of the Wizard's starting skills. Skill tiers were removed for the July 2011 Press Event, allowing skills to unlock steadily from levels 1 to 30. Consequently, all skill levels were adjusted and Mirror Image became a level 15 skill. The skill changed visuals at some point late in development where instead of "normal" clones of the Wizard, the Wizard herself and the images took on a metallic sheen, which added visibility in the playing field. Mirror Image was dropped to level 14 early in the beta. With the Patch 13 changes, it was classified as a Mastery skill and bumped to level 25. See the Wizard skill archive for more details on previous versions of Mirror Image and other Wizard skills. Or see Mirror Image (BlizzCon 2008) for the original version of this skill. Mirror Image animation sequence in the BlizzCon 2008 Demo. 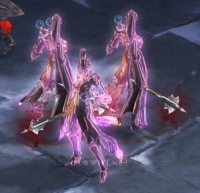 Mirror Image is basically a combination of the Assassin skill Shadow Master and the Amazon skill Decoy from Diablo II. The Mirror Image attacks monsters with a variety of skills, like the Shadow Master, but doesn't do any actual damage, like the Decoy. Although PVP and Arena play has yet to be released for Diablo III, there are still some things to take into consideration. For Mirror Image, despite whether it is or is not runed, the Collector's Edition wings create a bit of an issue. Mirror Image and CE Wings. As seen in the image, only the actual Wizard displays the CE Wings, which are a vanity item from the Collector's Edition, giving away which Wizard is the player. Current version of Mirror Image. Mirror Images casting Spectral Blade. Duplicate Conjuring is a retired skill that provided for more images. Conjured Health is a retired skill that gave more health to Mirror Images. Skill runes made both skills obsolete. This page was last edited on 4 July 2012, at 18:44.